The landscape for finding a job in PR — or in any field, really — has changed dramatically over the past several years. It used to be a straightforward path: you sent your resume or application through a job board or connected with a recruiter in person. Now social media has uprooted that process, and today, a shocking 93% of organizations use social media to hire. What that means for you is: you need to step up your presence on social sites. Here are a few more tips to help you position yourself as the ideal PR employee. The larger your social network, the greater the chance you’ll find a job through it. Also, increasing the number of people you’re connected to provides social proof that you’re an active and engaged member of a given social community. But that doesn’t mean you should start following everyone. Pay close attention to the bios or profiles of the people who follow you (an easy place to start) and see if a) they’re in your industry, b) they’re recruiters or c) they work at a company you’re interested in. Anyone who falls outside of these three probably aren’t going to provide the value you’re looking for. As you begin following targeted people, sites like LinkedIn and Twitter will make recommendations about other people you may want to follow, based on algorithms. Social media is ideal for showing off your industry expertise, but you’ve got to know how to do it. The people I love to follow share relevant and useful content with their followers, engage in industry conversations, and answer questions. You may not feel like an expert in PR yet, but sometimes it just takes digging in and sharing what you know. Subscribe to public relations blogs so you’re armed with plenty of PR news and trends to talk about and share. Also search for hashtags like #PR or #PublicRelations to keep up with what people are chatting about on social media. Twitter chats are essentially virtual events at a set time on a given topic. Topics might include career advice, personal branding, or even just a meetup of PR folks. They’re a great way to network as well as learn. If you’re new to using your social accounts for professional use, you might want to clean up your bio, focusing on your PR experience, not your love of sushi. Use a professional headshot to portray yourself as someone hiring managers or recruiters would be comfortable interviewing. Keep your username as your actual name, and not some cutesy nickname. Remember, whether you like it or not, hiring managers are scrutinizing your profile to assess whether you’d be a good fit for the company. If you’ve applied for a PR job at a company, now’s the time to get aggressive with your social connection to the brand. If you know the hiring manager’s name, connect with him on as many platforms as possible. Without being a suckup, share his content and reply to his updates. Stick to interacting a few times a week: just enough to get on his radar. Follow other people at the company, and keep your ears open. You might discover information that you can mention in an interview to show how on top of this company you are. Your chance of getting hired through social media is greater now than it’s ever been, so maximize your chances. 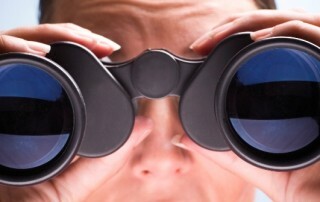 Are Recruiters Looking for You On Social Media? Think only your friends are hanging out on Twitter or Facebook? Think again — especially if you’re hunting for your next job. Employment recruiters are spending more time looking for qualified job candidates on social media, it seems. Because so many professionals are branding themselves as experts on social sites, recruiters are finding it easier to locate people with the skill set they’re looking for. Keep your social media profile clean. It does matter: 98% of recruiters used social media for recruiting in 2012, so make sure what they’re finding out about you online is professional and appealing. Can’t juggle several social media accounts? Focus on LinkedIn. You’ll find more recruiters on LinkedIn than any other social media network. Nearly 100% of recruiters use it, compared to their less frequent activity on Twitter and Facebook. Are you aiming big or small? Tailor your social networking use to your goal. U.S. recruiters at small companies are less likely to recruit on LinkedIn than big companies, but are more likely to use Facebook or Twitter. Have some downtime while lounging by the pool or on a long bus ride? Check job opportunities on the go: 53% of recruiters found mobile recruiting technology extremely important. Your Alma Mater may not matter as much as you think. Fewer than 4% of recruiters say that the name of the school the applicant attended would truly help differentiate her as a candidate. 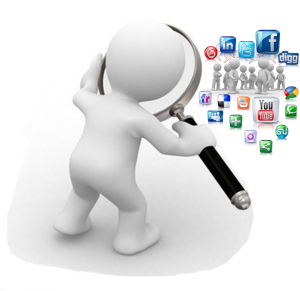 Depending on what field you studied, research what social network your industry focuses on. Interested in the restaurant or fashion industries, for example? Twitter is your best bet. Security and legal candidates are best suited to search for opportunities on LinkedIn, and those looking for a job in nursing should be perusing Facebook. Share your own insight on a subject, and don’t be afraid to weigh in on topics that matter to a professional in your field. Companies want to hire applicants who demonstrate superior social skills and network contacts, especially in business, marketing and sales. Social networks allow people to network effectively within their industry and leverage media sites such as Facebook, Twitter, and LinkedIn to complement their efforts to find better jobs. The best social media efforts enhance job searches, but applicants still need to follow traditional job-search methods to increase their chances of finding suitable job openings. 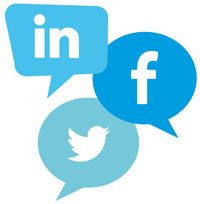 The social media allow applicants to study potential employers, connect with current and former employees, and learn about company brands. People can find out the details about organizations that companies prefer to keep hidden. Former employees often see things quite differently than corporate media outlets describe. Job seekers can find out whether they really fit the company’s profile before committing to time-consuming application processes or jobs that hold little promise for the future. Strategy for leveraging the social media includes approaching all social media posting and interacting in a professional way, staying focused on the goals job seekers want to achieve. People seeking to make career changes should first polish their resumes and change their social media profiles to match that information. This technique does not involve exaggeration or lying, but simply exercising discretion to include only those interests that companies would perceive as benefits. For example, if a company has a conservative reputation, then job seekers should avoid listing personal information that suggests liberal leanings. 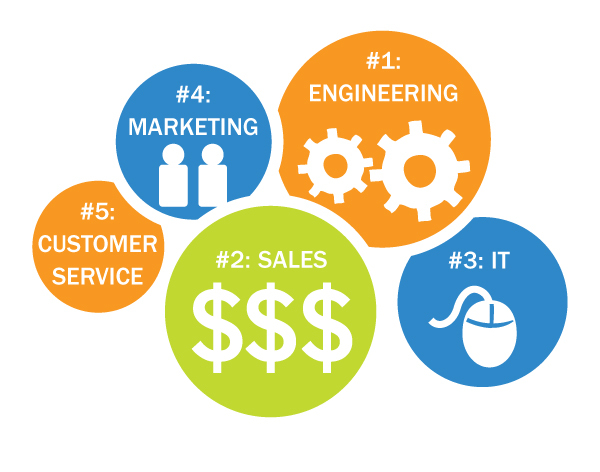 Networking with other professionals within an industry helps develop contacts for employment and personal references, and job seekers can strengthen their reputations as experts in their given fields. Most dynamic organizations use social media for marketing and research, so people who take part in the networks with strong media presences show potential employers that candidates care about their images and have essential media savvy they could use in their jobs if hired. Remember that serious recruiters also use the social media to investigate potential employees, so job seekers should avoid posting information that could prove embarrassing or compromising. Bullhorn Reach recruiting techniques offer software that helps employers find and recruit talent, and careful companies can monitor their employees’ social activity, personal brand choices, and other online activity. Strong social media presences in certain industries could lead to companies recruiting job seekers, so applicants should always keep their social activity within the bounds of good taste. Social media research allows applicants to create focused, relevant resumes and cover letters that highlight the qualifications particular companies are seeking. Savvy job seekers cannot afford to ignore the important influence social media have on modern business. This is a guest post from Sam Peters, a blogger who enjoys writing about career development. Is Pinterest Worth the Effort for Talent Seekers? 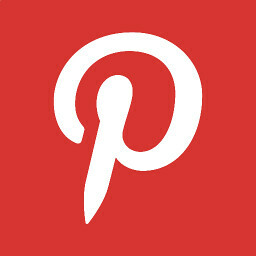 Pinterest is one of the newest social media websites, and it is mainly used by women to save craft and decorating ideas. The site, however, has big potential for both job seekers and talent seekers. When used effectively, Pinterest can help prospective employees find jobs, and companies to determine if a candidate would be a good fit within their company. Job seekers are using Pinterest to display their portfolio or create a visual resume. Since boards can be made of stand-alone pictures or links to a website or blog, the user can create a board with pins that link to their site, display a picture with a caption or a combination of both. Since all boards on Pinterest are public, a talent seeker can search using related keywords and find potential employees. By browsing the person’s other boards and pins, the talent seeker can get an idea if the person would be a good fit for the company. A person’s boards say a lot about the person and their personality, so look for items that fit the ideals of the company. Some Columbia, South Carolina schools use Pinterest to provide career advice ranging from writing a good resume to job interview guidelines. A board’s followers are public, so look at the profiles of those who follow the board and read comments on pins to find prospective employees. If you are advertising for a specific job, invite job seekers to create boards on Pinterest with ideas that relate to a subject. They can tag the business name in the comment section or email a link to the board. This allows the candidates to think outside the box and show what they can create, and it makes it easy for the talent seeker to look at submissions. More and more students and job seekers are turning to Pinterest to look for jobs, including South University in Novi, MI students. They are familiar with the site, how it works and some even have their resumes and work already posted on the site. Professionals are using the site to showcase their work in many different fields, not just creative fields. For example, teachers can create boards with strategies and ideas they use in the classroom. If you are looking for new talent, don’t forget to look at Pinterest. Facebook, Twitter and Google Plus are, perhaps, better known for finding talent, but the visual nature of Pinterest makes it ideal for job seekers and talent seekers. You can learn about a candidates ideas, previous work and their personality by browsing their boards and pins. This Guest Post was contributed by Sam Peters, a blogger who enjoys writing about creative ways in which job seekers use Pinterest to draw attention to themselves during the job search. We know social media is playing a large role in job recruiting, but how big? Jobvite recently looked at how companies like Whole Foods, Etsy, Starbucks and Zappos are recruiting online. Here are the findings. It should be no surprise that companies recruited the highest number of employees through LinkedIn. Out of all social hires, LinkedIn accounted for 73%, while Facebook lagged behind with 20%, and Twitter 7%. 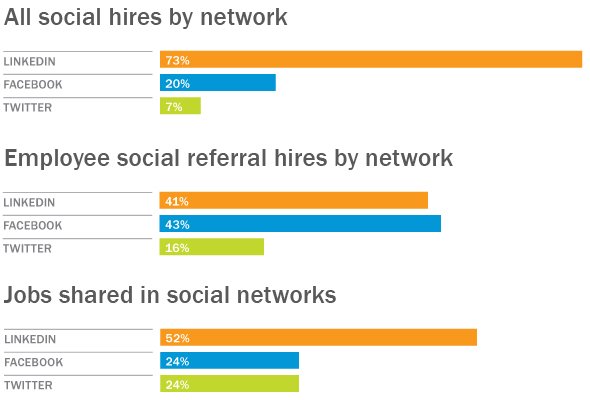 Surprisingly, though, Facebook beat LinkedIn by 2% (43%) of employee referral hires through social networks. I suppose it makes sense considering people tend to be more interactive on Facebook, and LinkedIn takes more of an effort to interact. Many users seem to use it more as their online professional profile. It’s easy to put up a profile, connect to people and let others come to you rather than really use all of it’s features to its full potential. While you know that having a friend refer you for a job gives you a boost toward getting hired, it shows in these results as well. For every 10 applications a company gets, one referral applicant is hired, as opposed to one out of every 100 general applications. What Industries Turn to Social Media? There are also certain roles that get recruited more online than others, and on different social networks. On LinkedIn, Product Management and IT roles were the highest type shared, while on Facebook, it was Marketing and Customer Support jobs. On Twitter, companies looked for Administrative and Accounting & Finance staff. Clearly, the way companies look for new employees is changing with social media being an easy way to either amplify a job posting or access talent quicker than more traditional ways of the past. How Can I Find a Job Through Social Media? If you’re not already looking for a job through social media, set up a profile, connect with the companies you’re interested in working for, and start sharing posts that illustrate your knowledge in your industry. Share posts and links to content that speaks to your industry, and ask and answer questions. The more complete your online profiles, the higher chance you’ll have of being “shortlisted” by potential employers and recruiters. But be proactive! Also look out for which accounts post jobs (sometimes a company has multiple accounts, especially on Twitter, and may have a dedicated job profile set up) and act quickly when you see a job you want. As social media becomes a valid source for finding a job or networking with people who can help your career, it can be harder to stand out in a sea of Tweets and status updates. If you’re not sure how to use social media for job hunting, here’s a list of seven types of updates you can use to get the attention of employers and industry leaders. The key is to connect with people who work at the companies you’re interested in, as well as industry colleagues. Blanket following any and everyone won’t help you achieve this, so focus tightly on the right network. You should have a blog to show off your writing style as well as your philosophy on your industry. Share these posts through your social media channels. If you scan through your contacts’ Tweets, Facebook updates, LinkedIn posts and Google + links, you’ll likely find tons of links to articles and blog posts that you enjoy. Read and comment on them, but also reshare them. This shows the person who originally share the article that you’re paying attention. Try to include a personal comment (“I really need to work on Shelly’s fifth tip for writing!”) to give it a personal touch. Industry experts are on social media, and with the right approach, available to you. Why not get advice or start a conversation as a way to connect? Say you’re in PR (or want to be): you could ask a journalist or owner of a PR company their thoughts on a current industry issue. It’s a good conversation starter, and one others might jump in on. Besides the usual social channels, there are sites like LinkedIn Answers, Quora and Focus where users ask questions and get answers from others. You can be on either side of this fence, but answering questions shows you’re knowledgeable in your field. Follow anyone who asks a question in your field, as well as others who answer them to build your network. Employers want to hire people who are passionate about what they do and knowledgeable about industry news and trends. The best way to stay on top of them? See what people are saying on social media and share your own insights. Got an issue with the Online Piracy Act? Voice your opinions. But make sure your comments aren’t emotionally based and have fact to them, or they might turn off potential employers. Not every Tweet and status update has to be about work and your industry. Get to know the people you’re connected with. Wish them a happy birthday. Ask about their kids. Respond to their personal status updates. It’s a good way to build trust without an agenda. Hashtags are designed to help people find information about a particular area of interest. 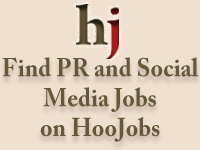 That might be your next #PRJobs or advice from #journchat. Not only do you learn things, but you also get great contacts. There’s a million ways to use social media to network and find your next job. Use a combination of all these strategies to come up with your own way. These days, it’s not uncommon to see people tweeting or blogging about unemployment. In fact, it’s becoming quite the trend. With around 14 million people out of jobs, it’s not surprising that many find comfort in knowing that they are not alone in their hunt for a job. Quite a few new hashtags and Twitter accounts have popped up by those who want to share the experience of being jobless. While some people are using social media as an outlet for their frustration and complaints, others are turning it to their advantage and landing jobs by posting about their most recent adventures in job hunting. Sharing experiences about job seeking can be therapeutic in that people have someone who has similar experiences to talk to. Some of the unemployed may not be comfortable talking to their family or friends about what they’re going through, so having a social outlet can be useful and helpful in getting through an emotional swings of unemployment. You do have to be careful when posting about your life as an unemployed person. Remember that potential employers will be searching for information about you and if you have posted something unfavorable, it could cost you the job. Employers use social media sites to get insight into your overall personality – hopefully their investigation leads to finding a well-rounded, interesting person. Unfortunately, many people use it to vent their frustrations, completely unaware of who might view it, sending out the warning signals to any potential employers (including those who might not be hiring, but could recommend you for a position!). Venting too much, posting disparaging remarks about your ex-employer or badmouthing a company that didn’t hire you could make a contact think twice about making contact about an open position. Twitter and other social media sites are ideal for finding like-minded people in search of a job. TwitJobSearch and TweetDeck have partnered to create JobDeck, a platform that not only finds jobs on Twitter, but also sprinkles in advice for the jobless from recruiters and HR experts. Profiles like @NJUnemployed and @unemployedsucks offer a gathering place for those united in the search for a job. Facebook has groups where the jobless can meet up with each other and network, as well. LinkedIn Groups like “Unemployed? Get a Job” also provide support and resources for the jobless. All of these networks offer a chance to connect with others in the same boat and can be helpful both in support and advice. Blogs are also pulling in those without jobs and offering them support and advice. 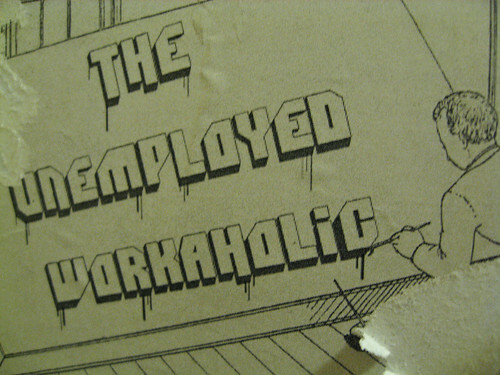 Unemploymentality covers the lifestyles of those without work. 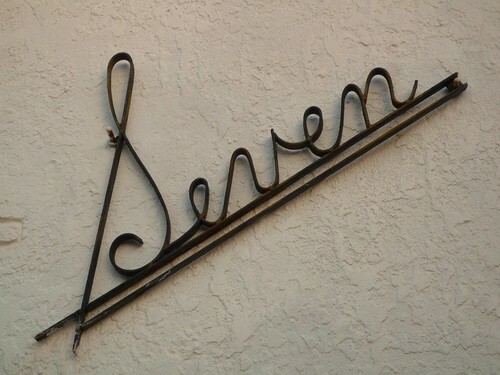 Another blog that follows the life of an unemployed woman is Bureaucracy for Breakfast, which covers marketing and news. Social media is a valuable networking tool. Know how the information in your profile is your shared and how a potential employer could view it. Use it to connect with others, both employed and unemployed, and share your experiences in a positive way. Future employers will appreciate the effort and will see that you are a positive person who makes the effort to get out there, all of which are good qualities in an employee. This is a post by PR columnist, Alison Kenney. Like many people, when it comes to Google+ I’m wary of putting time and energy into another social media network, especially when there’s not a lot to be gained from doing so yet. Unlike the major social networks Google is trying to unseat with Plus (such as Facebook and Twitter), Google+ isn’t attracting the masses and the folks who are attracted are scratching their heads once they join. First, have some perspective –Google+ got an impressive jump out of the starting gate with 25 million people signing up for it in the first month. Technology “geeks” and social media experts rave about it. On the other hand, Google+ visitors have dropped 37 percent in the last few weeks, according to Alexa and plenty of “ordinary folk” who got into the beta have expressed backlash for Google+. What do you think? Have you tried Google+? What do you think it’s chances are? Alison Kenney an independent PR practitioner with more than 15 years of PR consulting experience. She is based on Boston’s North Shore and has worked with organizations in the technology, professional services and consumer industries. She writes a bi-monthly PR column on LindsayOlson.com. You can find her at www.kprcommunications.com. Learn more about Alison Kenney. Social media sites can be very useful if you’re looking for a job, but it isn’t a magic lamp that you can just pick up and rub and expect a job to appear. It takes some effort and planning to ensure that your efforts return rewards. Networking on social media needs to start long before you actually need work. Just suddenly appearing and asking for a job is a sure way to turn hiring managers and recruiters off, even if you’ve done your research and know who’s hiring. You should have an established profile and some relationships built before you begin to job hunt. I like it when people approach me on Twitter, Facebook and my blog to ask about positions, the difference lies in how the person approaches me. Jumping into social media for the express purpose of contacting hiring managers will make you look desperate and is more likely to lose you potential jobs than give you a chance. Instead of starting when you’re desperate, get a head start on making use of social media by establishing visibility and relationships earlier. People are more willing to help and listen when they already know you. Even if you don’t currently need work, make a point of being active on social networks anyway. This is the perfect time to build relationships and get to know people without needing something from them. Interaction is key when it comes to establishing a solid relationship, so make a point of talking with others instead of just at them. There are a few ways to create successful connections with other social media users, whether they are hiring managers or not. Follow people who work for the company you are interested in working with. Don’t just watch them, however, take the time to actually talk to them. On Twitter, you can retweet their more interesting or useful posts, answer their questions or even ask them questions and discuss your mutual interests. Other ways to start interacting with companies and their employees is to comment on the company blog and tweet or share the link on your favorite social media networks, or contact them via email. Once you get to know someone well enough on social media, moving to email or meeting up in-person if local is an easy step and could give you a leg up on the competition later when you need a job. Ideally, you will have a well established social network by the time you are ready to start job hunting. If you are able, it may even be worth it to hold off on looking for a job for a little while in order to build up your network. Once you’re ready, you can let your network know that you are in the market for a position. When reaching out, be specific and make it easy for people to help you. Let your network know about what kind of opportunity interests you, or even the specific companies. If you know that a particular hiring manager has an opening or if you are particularly interested in working for them, reach out directly to that person. Some companies have very strong referral programs where existing employees can recommend you for an open position. If you know someone within the company, ask them about the opening. Asking for the recommendation is a big favor, though, so make sure you ask someone who has really connected with you and has some experience with your work. Keep in mind that anyone you ask about work should already have a relationship with you. Unless you are reaching out to an industry recruiter or the HR department, people generally don’t respond positively being asked for favors by strangers, so make sure you know the person you are asking and that they know who you are. It takes time to build relationships and these should ideally be relationships that will last even if they can’t help you find work. People tend to know when they’re being used, so keep it real and be genuine in your friendship. Even online, this matters and sincerity could make all the difference in whether you get a job or not. 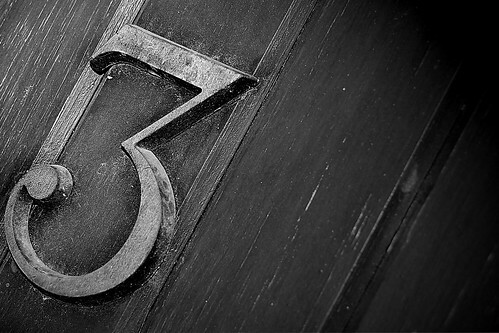 You’ve heard the advice that you should start a blog in order to help you find a job. It’s not always feasible to write a blog as Alison explains, so don’t sweat it if you don’t have one. Many other tools exist that will help you maintain a professional presence online that recruiters and hiring managers can find. Think of About.Me as a visually appealing resume with links to click on. Users can provide an overview of who they are, as well as link to their social networking pages, LinkedIn profile, websites, etc. You can include a photo of you, which is a nice touch to give recruiters a visual connection to you. The great thing about About.Me is that you can use it to funnel in all types of people to one spot. All your different social media and personal links are found on one page, which keeps you from having to list half a dozen URLs on your resume. Another perk? It’s free. The drawback is that you can’t really include your entire resume; it’s more a place to give a sense of who you are rather than the whole enchilada. Visitors still have to click on the different links to learn more. If you don’t have time to blog, consider Tumblr your “mini blog.” You can write blurbs on professional and industry topics you’re interested in easily, as well as share links, videos and photos. A hiring manager can view this as your interest and knowledge on a topic; it’s especially good if you don’t have a lot of job experience in an industry. It shows that you’re proactive in learning about your desired field of work. The disadvantage is the same as the benefit; if you’re trying to score a job that requires solid writing skills, recruiters might not see Tumblr as a reliable indicator of your writing ability. 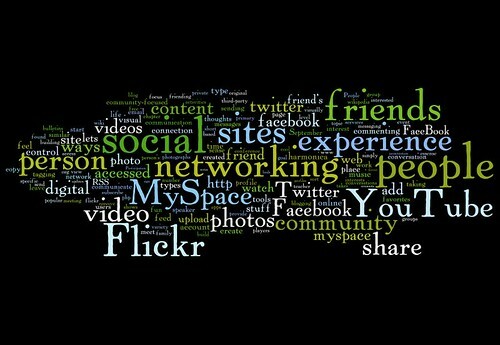 Social networking tools like LinkedIn, Facebook and Twitter are also good replacements for a blog in the job hunt. You can share posts and news, engage in conversations, follow topic hashtags like #PRJobs or #HAPPO to find jobs, or follow recruiters and HR staff. You might find out about a job before it’s even posted to the site if you maintain relationships through social channels. Keep in mind that having a presence on social media requires a lot of effort; if you’re not active, you’re invisible, and you won’t find a job that way. The key to being found online is to be there. Work to update these channels daily and connect with hiring managers and recruiters. Build the relationships before you need them so you don’t seem desperate for a job. This blog is to share my recruiting experiences and discuss thoughts on the job market, PR industry and technology. I'm an entrepreneur, business developer and recruiter. 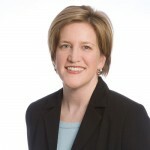 Alison Kenney is an independent PR practitioner with more than 15 years of PR consulting experience. Learn more about Alison Kenney. © Lindsay Olson 2017 | RSS Contents | RSS Comments. Proudly powered by Wordpress. Web development by SocialSnack.